My blog is called “living up to my name” because I strive to, like my name “Page” means, be a faithful servant to the King of Kings. 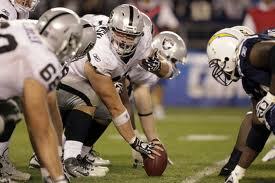 I came across the story of Stefan Wisniewski – Offensive Lineman for the Oakland Raiders. He has a name to live up to, as well. 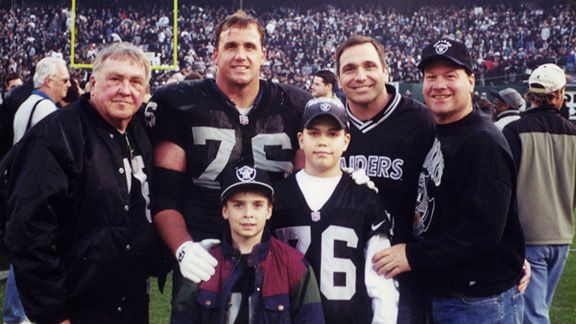 His uncle Steve Wisniewski was a 13 year NFL pro who was a member of the 1990’s all-decade team as a 8 time Pro Bowl Offensive Lineman for the Raiders. According to this article from ESPN, The younger Stefan was named in tribute to his uncle – he was born a month before his uncle began playing for the Raiders. There will be comparisons, to be sure, as he carries out his career for the same franchise where his uncle starred for more than a decade. But the two have something else more significant in common than their team, position and names. They are both devout Christians, looking to impact the world for God. Steve Wisniewski volunteers at the church that former teammate and current Raider chaplain Napoleon Kauffman started. Stefen spent some Spring Break time on a mission trip in Dominican Republic. 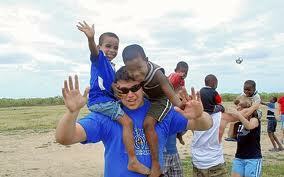 He spent time in Dominican Republic sharing God’s love with the people (especially kids) in the area. The group he was with brought clothing and supplies to the region to give out to the people who were in need. Stefen Wisniewski shares how God got his attention through a car accident when he was in high school. Through that experience, Stefen understood that he had been living a nominal Christian life. The verse that he shares is from Galatians 6.7– God will not be mocked. From that car accident, Stefen Wisniewski decided to take his relationship with God seriously, and allow it to be a cornerstone in every part of his life. I pray that we all hear this pleading cry from God – “Make me the most important part of your life” Seek me first and live for Me. I will take care of the details”. May we all understand what God asks of us – that He be number 1, so that at the end of our lives, we hear “well done good and faithful servant” and not “depart from me, I don’t know you”. Make God number 1 in your life – above ALL else! He will not be mocked and He will not share His glory!